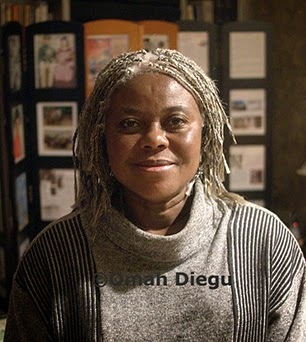 Nigerian-born, Ijeoma Iloputaife, artist name Omah Diegu, was among the first generation of U.S.-trained African filmmakers. She studied filmmaking at the University of California Los Angeles (UCLA) during the "L.A. Rebellion", a film movement whose objective was to legitimised African, African American and Native experiences and visual representation by confronting Eurocentric aesthetics and questioning western culture as the point of reference in film language and elements of style. Omah Diegu, who lives and works in the United States, talks about her experiences during this historic period and her evolution as artist and cultural producer. Omah, when looking at your cinematic trajectory, it parallels the first generation of Africa women filmmakers emerging in the 1970s and 80s, who went abroad to study filmmaking, though your path took you to the United States rather than Europe, which was the general tendency at the time. What motivated you to study in the United States and to pursue filmmaking at UCLA (University of California Los Angeles)? Perhaps before answering that question you could talk a bit about your background in Nigeria, what was it like growing up in relationship with cinema and the moving image? Growing up in Nigeria, Tarzan, Hercules, Zorro and such films were the type of fictional movies that were on television then; otherwise there were documentaries (mainly British) that dealt with serious topics such as the World War II. As a child, among other questions, I always wondered how the filmmakers were able to follow the characters in the movies throughout their exploits. More so intriguing was when a character was shown from childhood to adulthood . . . how in a couple of hours, year after year passed by. At secondary boarding school (high school), where there were no movies, I read all kinds of books. In the classroom when I was supposed to be listening to my teacher, I read; during siesta, I read; when I was supposed to engage the physical world, I hid in a corner and read mystery and science fiction books. I enjoyed the pictures I painted for myself in my mind, of situations that were described in words. I wrote short stories and plays, and did some sketches and paintings here and there. I entered some of them in Art Festival competitions in Nigeria and won awards. As a college undergraduate in the mid 1970’s, I studied fine arts at the University of Nigeria Nsukka (UNN), but worked as a newsreel correspondent with Radio Nigeria Lagos during the vacations. On graduation, I worked as a reporter with Nigerian Television Authority (NTA) Lagos. I thought I could truthfully report the events I covered, but the newsroom gave its own version of my reports as dictated by the politics of the day. When a colleague of mine was fired for investigating and revealing the disappearance of eight billion dollars from the national coffer, I decided it was time to look for another medium of expression. I chose to study how to tell a story that would allow intelligent and imaginative persons to get the true picture, without exposing myself to hostilities. I had visited England and the United States during a couple of summer breaks from the University of Nigeria; and thought I would be better off exploring new ideas in the United States. University of California Los Angeles (UCLA) film school offered me that chance. I had read somewhere that not only was it not Hollywood oriented (that is: independent film-making was encouraged), but it was one of the top film and television schools in the world. I guess I was drawn more towards the current affairs type of storytelling because my father had been killed as a result of the political situation in Nigeria of the late 1960s. Influential was also the surreal experiences I had during the pogrom and consequent civil war. My journey through all kinds of literature and real life experiences has taught me that there is no demarcation between true-life events and perceived fiction. The political climate of the 1970s in the United States played an important role in the intellectual and creative development of a generation of artists, and specific to UCLA, it was the catalyst for the emergence of what has come to be known as the “L.A. Rebellion”. Please talk about the cultural climate during that time and the impact of the “L.A. Rebellion” on your development as a filmmaker? What was your relationship with the other African American and "third world" film students in this context? “Until the lion - king of his jungle - tells his side of the story, the narrative of the hunt will always glorify the hunter-man.” - African proverb. There was no African student at the film school in my 1st year. I learnt that a Nigerian lady by the name of Grace had been there, but left a year before my arrival. My first film project was a super 8 short of an Ibo folk tale “Obaledo”. The young girl, Obaledo, was disobedient to her parents by switching the priorities, which she was enjoined with. This led her to venture alone outside of her home, in spite of their warnings. Consequently she exchanged her beauty for the ugliness of a spirit who accosted her from another world by imitating the spirits’ alien incantations. This simple folktale mirrored my creative mind set. However, my quest was for a more adult way to impart such subtle teachable moments to a sophisticated audience. During that time the presence of African film students was indeed rare, what were your experiences, and in particular as a woman? It also appears that two of your fellow filmmaking students were also from Africa, Ruby Bellgam and Anne Ngu, did you work with them at all? Yes indeed there were few Africans at school in California – period. Most were in the East coast. However, in the Black American / Caribbean film students at UCLA, I saw Africa; not necessarily because they were black like me (a couple of them were actually light skinned and of multiple race). There was this sense that they longed to inculcate and interpret the Africa embedded in their very being. I worked with Melvana Ballenger who came in the same year as I; also with Ben Caldwell, Pamela Jones and Bernard Nicholas among others who were earlier. There were also a couple of white American film students who were working on films they shot in Africa. I was at home with all of them and worked in any projects to which I was invited. So when Ruby Bellgam came to the film school - I believe that was in my 3rd year - she was like any other black student to me. However had she arrived earlier I probably would have sought to cast her as the African woman in my short movie African Woman-USA because of her physique and accent. The Nigerian Segun Oyekunle, like Ms. Bellgam, might also have been invited to participate in my projects. This movement appears to have galvanized a pan-African, Third World-ism among the students of colour. In what ways did this shared cultural ideology manifest itself among the students as it relates to filmmaking? There was Professor Teshome Gabriel of UCLA History of African Cinema Studies who literally nudged us along the path of finding our own cinematic identity, which would be relevant to our unique sensitivities as children of British neo-colonialism and post American racial-segregation. However, we were all practically handicapped by an inadequate film production budget that limited our ability to fully exploit our creativity and experiment with enough materials for our “masterpieces”. We saved money and gathered experience by working on each other’s film and television projects in whatever capacity was needed: be it as cameraman, sound engineer or actor. What is your relationship to Nigeria and the film industry there, which by the way has imposed itself on the global cinematic landscape! None! Of course I am with the filmmakers in spirit and laud them for bulldozing their way into the global cinematic landscape in spite of meager budgets and lack of movie theater distribution. I am first and foremost a fine-artist – that is my very being. For the life of me, I am not able to create without trepidation, anything that does not come from my very core… i.e. Just as I cannot come up with any finished oil paintings except those that sought my canvas of their own volition, I cannot make a film for the mere purpose of entertaining an audience and making a buck. Of course if I were to be inspired to produce something in which an audience is also entertained, that would be a bonus. You made several films during the 1980s and 1990s that reflect the themes of the “L. A. Rebellion” as well as working within the theoretical framework of Third Cinema, such as African Woman U.S.A., Atilogwu: The Story of a Wrestling Match, The Snake in My Bed. Could you talk about the films within this context, and especially the latter, The Snake in My Bed for which you are best known? African Woman U.S.A. tried to address challenges that black women generally face in the US: be it from the white man (institutionalized racism) or black man (black-on-black violence). It underscored the animosity that exists between black people who came to the US of their own free will (usually for educational purpose) and those Americans whose African ancestors were forcibly transplanted. However it fell short of fully addressing the issues due to budget constraints. This made the film rely on dialogue to make a quick point where more visuals and lengthier film would have made a more memorable impact. Atilogwu: The Story of a Wrestling Match is the film of a dance by a Nigerian Igbo dance group known as “Nkpokiti”. The dance interprets the story of a wrestling match during which a hero endowed with mystical powers was victorious. One must know the Igbo culture; understand the meaning of the various dance steps, visual and audio expressions, as well as the role played by each music instrument, to fully follow the story line. Otherwise “Nkpokiti” is just another visually pleasing acrobatic dance. My intent in filming the dance was to eventually add a narrative study enhancing the symbolism of various aspects of the content expressions, so that a greater audience of non-Igbo-culture-savvy will appreciate the depth of the performance. Chinese martial arts is widely enjoyed today because at one time, the codified systems of movement was explained to the audience: i.e. the deeper meaning of poses imitating the snake, praying mantis etc. Ballet such as Swan Lake Op. 20 by Tchaikovsky is enjoyed, not just because of the music and beautiful dances, but because it tells the story of Odette, a princess turned into a swan by the curse of an evil sorcerer. My film The Snake in My Bed is as is. Addressed to my son, it is a personal recount of a clash between two distinct cultures, two races, spanning two countries and two continents; and finally reconciling at a common ground. However it is a human story that is played out time and time again, in all variations, everywhere between any given cultures and race, be it without or within national borders. It is a story lived and told in such a way that one concedes inferiority to no one, no people and no place. It is such an earnest tale that anyone who appreciates what went down will comprehend a connection to his/her own life. Will I go out of my way to garner broader interest in the film, especially in Nigeria? Once upon a time I might have. I refrained when at the time in 1995, of the initial release of the film at The Pan-African Film and Television Festival of Ouagadougou (FESPACO), my brother Bishop Iloputaife who spoke up against the ills of the ruling Government of Nigeria was gunned down by assassins. His efforts to make a difference to the lives of others in Nigeria only landed him a bullet to the head; and for what? Conditions in Nigeria today are worse than they were in his own time. To make matters worse, my film got badly scratched-up and bled magnetic sound strip caused by a malfunctioned projector at the festival. I was thrown into such a depressive quagmire that I elected not to send my film to any other festival or even consider making another. Suffice it that about 20 years later I was persuaded by Jan-Christopher Horak to include The Snake in My Bed as part of the “L.A. Rebellion” collection. Of this I am well pleased. The film is bound to still do someone somewhere some good someday. And I might yet finish a script and make another film. According to Jan-Christopher Horak, The Snake in My Bed reflects the tenets found in many of the films of the “L.A. Rebellion” such as the focus on institutionalized racism, colonialism and issues relating to women of colour. Could you talk about the making of the film in terms of your motivation, the form and content and also its reception? That it has the German title Die Schlange in meinem Bett indicates that it was released in Germany, which of course is not surprising as the film focuses on your own personal experiences with Germany. What role did Germany play in the production of the film and what was its reception there? Dr. Jan-Christopher Horak wrote such knowledge-filled and telling exposé of The Snake in my Bed that I marvel at the extent to which even the most subtle nuances in my film was picked up. I made The Snake in my Bed as I would any of my paintings: an abstract vomit from the very depth of my soul. Just like with all paintings, one either gets it, or does not. However it helps to have knowledge of art appreciation in order to fully comprehend the depth of a true work of art. Nevertheless every grown individual has sets of life experience from which can be found communion with something in another’s. My motivation in making the film is shrouded in my earlier quote: “Until the lion - king of the jungle - tells his side of the story, the narrative of the hunt will always glorify the hunter-man.” - African proverb. My film is in the form of what I would call “Abstract Documentary”. Unlike a regular documentary or docudrama, my story is a juxtaposition of the narrated recount of past events (the “historic”), with the present scenic reality (the “now”). The “now” is enhanced by select activities undertaken by the narrator (Griot) and the sole character (audience) to which the narration is addressed in the film. Some of these activities involve visiting the actual venues, but not reenacting the events, highlighted in the narration. Other film locations hold abstract symbolic ties to the narration; likewise the actions of the characters therein: be they human, animals or projected imaginary. These elements are punctuated by earnest discussions between the narrator and various characters who were actual witnesses to the recollected episodes. I also said: “He, who pays the Piper, calls the tune.” The film “The Snake in my Bed” was bankrolled by the German companies: Die Kuratorium Junger Deutscher Film and ZDF (Zweites Deutsches Fernsehen). There were aspects of my odyssey in Germany that had I included them in my script, my film might never have been produced there. These were not complimentary maneuverings by some higher authorities of the German government. Their actions were mitigated, at some time though, by an elected German politician of a minority liberal party, and at another by the Nigerian Embassy in Bonn. All these intrigues and counteractions were going on outside of the judicial system that was still trying to sort out the German officials’ mess-up with my son’s birth certificate and legal status. Then there was the German activist organization - of which my diligent attorney Marion Tamura Ikeda was a member - that publicized my son’s dilemma in a German newspaper. This had precipitated expert legal opinion being advanced, pro bono by a concerned German citizen, to the relevant court. So in spite of not blatantly telling all in the film (and probably all the better so), I could still make my case to an empathetic German audience; especially those within the lawmakers, bureaucrats and interracial community. My film aired a couple of times on German television and theater. It is of great consolation to think that my story played a part in the enactment of a law in Germany - soon after the debut of my film there. This law recognized the German citizenship of an interracial child born to an unwed German man, as an earlier one had done for the child born of an unwed German woman. This meant equal right of German citizenship to every child born of a German parent! For even though I married his German father in Nigeria, some German bureaucrats, hell bent on throwing my biracial baby to the dogs, were able to feign ignorance of the legality of my marriage. This way, they could camouflage their racism under the umbrella of the absence of a specific law protecting the biracial “illegitimate” child of a German man. On another level, the drive to make The Snake in My Bed at that very time in space was the chance to preemptively tell my son the story of his birth and ancestry in the event of my precipitous demise. That would help him never to let anyone else define him. As his Griot, my son is my primary target audience hence I addressed him directly. I could not have asked for any one more appreciative. What cultural and film activities have you been involved in during the past several decades and what are your thoughts on the renewed interest in the “L. A. Rebellion”? Well in terms of filmmaking I am working on a novel/script that encompasses different perspectives of deities and elements. While at the University of Nigeria (UNN), I wrote an Igbo language play: “Iwe na Onuma” on this very theme. I lost this play in the hands of a renowned Nigerian playwright who was a professor on campus, but relocated to London before I could retrieve it. The necessity to pursue a reliable sustenance income as a single parent tampered with my artistic spirit. When I finally have time on my hands, I am hard pressed to find the same zest of my youth to make a difference in society. I enjoy my creativity in home décor, renovations, multimedia designs, paintings etc… to find peace with myself. I welcome any who gets joy from what I create. Do I go out of my way to look for who will appreciate my work? No. Not I. In terms of the L.A. Rebellion, those who are interested in the films showcased there will learn things that will add to their cultural intelligence. Any one of the films is a projection of the creator’s soul in all its unpretentiousness. The way we were. Interview with Omah Diegu by Beti Ellerson, July 2014.